What I Drank Prior: a 12 pack. Yes. I am a young skinny 27 yo woman and I am still functioning. 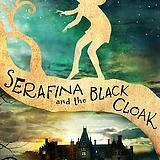 So there’s this chick named Serafina. She’s weird. No one knows she exists except her dad. This middle-grade novel is wonderful. Basically people start going missing and she has to figure out why. I love it. Characters: I love them. All of them. They’re so real. They have these real life problems and insecurities that don’t jsut “go away” after a pep talk. That’s one of my biggest pet peeves is when mental ilness just goes away. ANYWHO these caracters are well done (dude i’m super drunk). Plot: While the plot was benign and childish it was supposed to be. This is middle grade. THink of HP 1 through 3. Problem, puzzle, heroes solve, heroes win. That’s this book. BUT it was executed in a way that was pretty unique. Pretty great. Writing Style: Also pretty great. Nothing super literary but also awesome in some ways. I have plenty of quotes written down because they make me happy and stronger. I efel like middle grade does that more than other genres do. anyway READ IT. What to pair it with: Something warm. A Hot Tottie for example. I looooooved this. super warm and fuzzie.